The Venus of Oprah is located in her 2nd house on the cusp and is in conjunction to the Sun, in sextile to the Moon, in trine to the Jupiter, in square to Saturn, in quincunx to the Rising Sign, and trines to the Midheaven. Her Sun, Venus, and Mercury are in Oprah's 2nd house. The Uranus rules 2nd, trines Mars and squares Neptune. Sun and Venus are the rulers of her 5th, 8th, and 10th houses which are conjunct each other in the second house, and conjunct the second house cusp. Hugh Hefner, worked hard to get his wealth, and the activity of his 2nd house ruler - Venus is weak. He has a square including Neptune, Jupiter, and Saturn. Arnold Schwarzenegger has the Sun which rules 2nd house conjunct to his second house cusp, conjunct to Saturn and Pluto, and sextile to Neptune. Bill Gates has Jupiter in conjunction with Pluto in the 2nd house, square Venus and Saturn, Venus and Saturn are also conjunction, and sextile Neptune. People who have positive aspects involving Jupiter-Neptune have potential to be wealthy, especially through faith and religion. The state of Venus in a chart can show some information about your ability to magnetize material wealth. Only magnetize, the ability of the person to spend this money wisely is another topic. 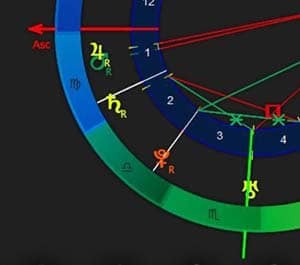 If Venus is in positive aspect to the ruler of 2nd, 8th, 11th and 5th houses or is located in one of them, the probability that money come to your pocket easily is pretty high. If Venus is in rather complicated aspect with Neptune, it is a sign of difficulties with handling money and proper expenditures, especially when one of these planets rules 2nd, 8th, 11th or 5th houses. When the Neptune has a positive aspect to Venus and Jupiter it is an instant green light for money to come to your life. A lot of charts believe rich Saturn to symbolize 2nd or 8th house. Opposition of the Saturn is a bad sign, while conjunction or square are considered to be slightly easier. However, Saturn aspects are believed to be among rather favorable ones when includes aspects with Neptune, Venus, and Jupiter. Saturn inspires strong ambitions which are realistic are practical. Saturn motivates people to save money, accumulate and to make more and more. If Saturn hosts one of the money houses, the chart owner would rather save money than recklessly spend them. People of this kind are more likely to keep their money if they win a normal sum in the lottery. Though we have spoken about the markers of the wealth, it is really wrong to look at the 2nd house and see the pure wealth indicator. Astrology is as life: things are a little bit more complicated and double-sided here. We try to remember that the 2nd house usually depicts the self-esteem of a person. How much does personal natal chart show about money and wealth? The 2nd house symbolizes income and ambitions or desires regarding money. 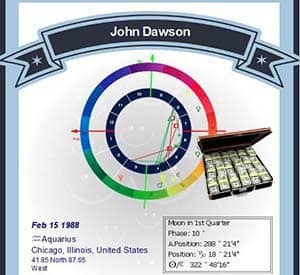 The 8th house symbolizes money gained through connections or long-termed relationships. The 11th house symbolizes money obtained via career ladder and entrepreneurship. The 2nd house's ruler is the mark of the person's tendency to wealth, according to many astrologers. However, the main point here that in reality a person is quite satisfied with the way things are going.